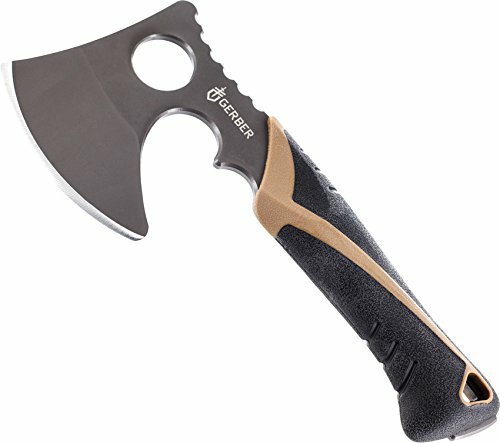 Gerber Myth Hatchet (31-002698) This robust-bellied hatchet is enhanced to expertly skin and chop hunting's biggest and best game. The Myth Hatchet's cleverly engineered rubber handle, developed expressly for a grippy but not sticky hold, keeps to its Myth family tradition of design for professional hunters and guides. Features: - Full tang - Hardness 56-59 HRc - Well balanced - Created for skinning and chopping - Molded protective sheath Specifications: - Overall length: 8.5" - Blade length: 3.5" - Weight: 14.6 oz. Forged steel head + unique blade grind for edge retention. Compact size for fast chopping + efficient use of time, exertion. Engineered rubber handle is shock absorbent + grippy. Plastic sheath locks into hole in blade for safe transport. Ultra-sharp tool ideal for professional hunters + guides.